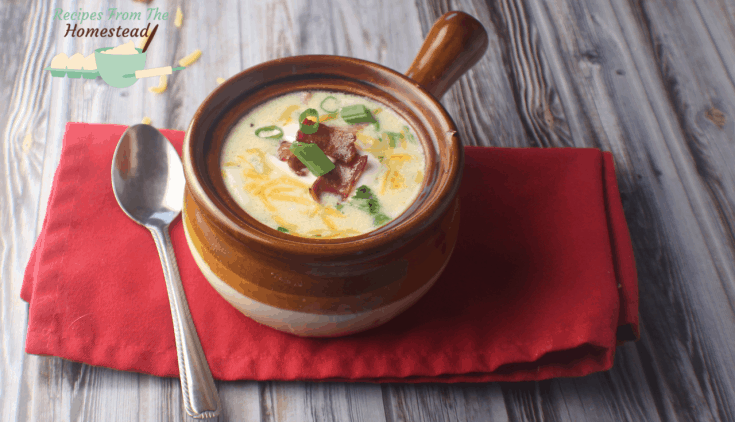 When it’s cold outside, warm up inside with this creamy, cheesy, loaded baked potato soup! Perfect for using up leftover baked potatoes, too! The men in this house like their baked potatoes. With loads of butter, sour cream, cheese, you name it. They have also been known to top their baked potatoes with chili, broccoli and other yummy toppings. 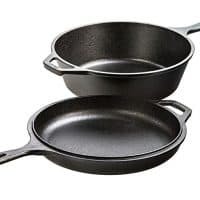 Whatever the topping, they are enjoyed fully as a side dish to a huge meal, or as the meal themselves, if a lighter meal is wanted. It’s pretty amazing how versatile baked potatoes can be. They are full of vitamins and minerals, such as Vitamins A, B, and C. Some believe that they can help improve digestion, as they do have a huge amount of water in them. One of the best things about potatoes is that they are generally pretty inexpensive. For most areas, they are less than $.50/lb, and 1 pound of potatoes is a LOT. You can also try stocking up on potatoes during the holidays, as they will go on sale. Potatoes can store very well in a cool, dry place, until you are ready to use them. Just don’t stick them in the fridge, as that can turn the starches and make them unpalatable when you go to use them. Wanting to grow potatoes for yourself? Little Sprouts Learning has some great tips here. So next time you are planning on making baked potatoes, try tossing a few extra into the oven and saving them for this loaded baked potato soup. It’s easy to make a double batch and save some for later. 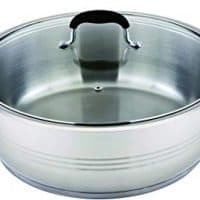 It can also be made ahead of time and kept warm in a crockpot, making it a delicious soup to take to a large gathering. It’s a creamy, cheesy, soul warming soup that takes very little effort to make. 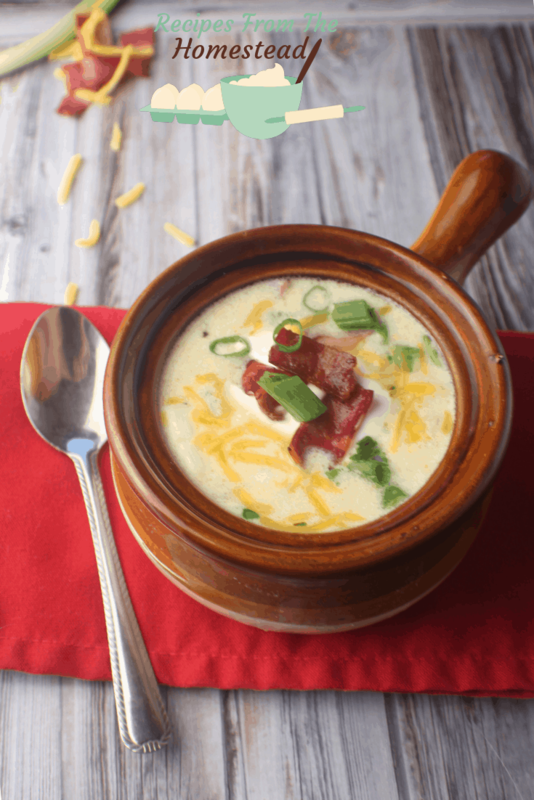 Let’s make some loaded baked potato soup! Serve topped with cheese and chives. What is your favorite way to eat baked potatoes? Do you top them with loads of butter or are you more of a broccoli cheese fan? 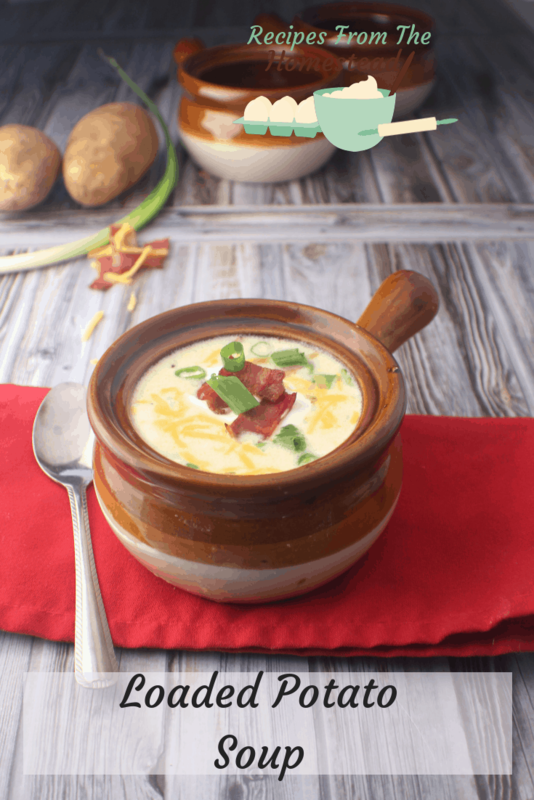 Be sure to let me know if you try this loaded baked potato soup and enjoy it!